In November 1963, Time Magazine was preparing its cover story for December. The man who was going to feature was a jazz musician called Thelonius Monk. Which, even if Gang Starr hadn’t reworked it to describe his music as “a melodius thunk”, would still be pretty much the greatest name of all time. Monk played the piano like he was constantly on the verge of being out of tune. But he knew exactly what he was doing. It sounded accidental, but it wasn’t. He also wore a hat extremely well. His presence on the cover of Time would be huge. Like Flying Lotus appearing on Newsnight. Sort of. On 23rd November, President Kennedy was killed. So in December there simply was no other story. (It eventually appeared in February 1964, by the way. I like this little fact because it’s new to me. I only found out yesterday and I can’t believe I didn’t already know it. I’m a Monk fan. I studied US history. I even work in media. I like to think it was a mix of curiosity and serendipity. Because yesterday I popped into the White Cube on Bermondsey Street. I always go when I’m at MEC’s workshop space down near there. The first room I went in was an installation. It was a library. The (extremely high) wall was covered with shelves and lined with books. Ladders stretched up to various heights, tempting you (well, me) to climb them. Soon enough I found a book I couldn’t resist picking up. It was called Black Music, by a writer called Leroi Jones. This meant it would be about jazz. I looked at the contents. There was a chapter on Monk. I turned excitedly to the first page of the chapter. 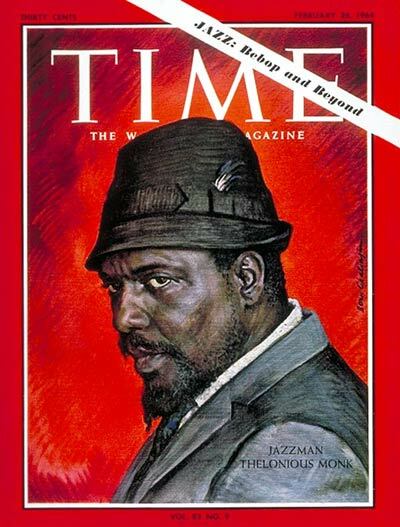 And there was the story of Monk’s Time cover-that-nearly-was. So there you have it. Curiosity and serendipity. And a lifetime’s interest in stuff. It seemed accidental, but it wasn’t. One page of one book in one room in one building on one street in one city on one day. Imagine what we might discover if we only looked more often.